The writers for these papers, many quite prolific, largely specialised in writing for this format. However, stories by poular hardback authors also appeared. Charles Hamilton, the creator of Billy Bunter, was the most prolific of all the story-paper writers. Under his own name and many pseudonyms, an immense output flowed from his fertile mind. But war seemed to have brought this to a final halt. However, two new privately circulated magazines kept the works of Hamilton alive. These magazines, founded in Canada in 1941 and England in 1946, also amalgamated as Story Paper Collectors’ Digest, which is published monthly in England and with an Annual. In 1947, the first hardback Bunter book appeared. Other hardbacks, not all featuring Bunter, followed, and later the papebacks. If Bunter is the best remembered of Hamilton’s many memorable characters perhaps the finest is the portrayal of Heny Samuel Quelch: ‘a beast but a just Beast.’ He is one of the greatest schoolmasters in fiction. The Bibliography is in date of publication order. All add something to the knowledge of Hamilton, of his witings, or of his characters. I am greatly indebted to the authors and editors of the various works. The best overall view is Frank Richards by Mary Cadogan. My special thanks to Mary for the Girl Scout and Menton references. Is this the first mention of the All Blacks in fiction. The source is a juvenile story-paper (Magnet No.53) published in England on 13th February 1909. 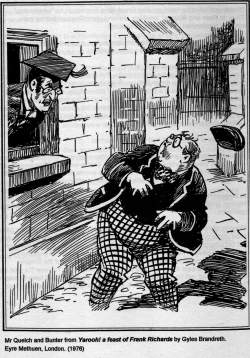 Magnet, which was published weekly, recorded the Greyfriars saga of Harry Wharton and Billy Bunter. The author was Charles Harold St. John Hamilton using his best known pseudonym of Frank Richards. Why did Hamilton make this All Black reference, which obviously refers to the 1905 All Black tour? The context does not involve a football match and Greyfriars was a soccer, not a rugby playing school. Whatever the reason, it suggests that the All Blacks’ style of play and interpretation of the rules incurred the wrath of the referees, and that this had been duly recorded by the press. Charles Hamilton was born on the 8th August 1876 and began his writing career at 17, his first story being published in 1893. By the turn of the century his school, adventure, sport, western and detective stories were appearing in numerous story-papers. 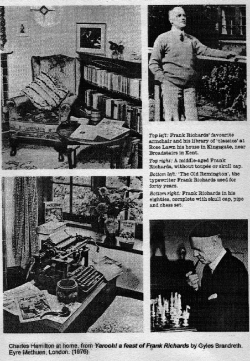 But Charles Hamilton may have only been known as a prolifc writer of juvenile stories, if it had not been for Harmsworth’s Fleetway House, later Amalgamated Press. Fleetway House recognised Hamilton’s talents, and decided to secure his services on a regular basis. He was to write the feature school story in a new series of Gem, involving his St. Jim’s School. Moreover, a similar length story about a new school, Greyfriars, in a new story-paper, the Magnet. 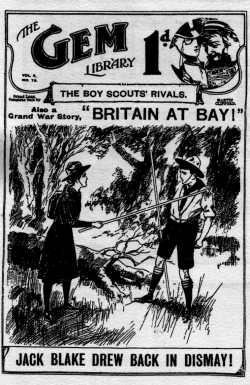 Both papers appeared in Februay 1908, the stories written by ‘Martin Clifford’ and ‘Frank Richards’ respectively. His publishers may have hoped that this work load would curtail the time Hamilton spent writing for other publications, including music. A writer of popular songs, his soccer version (twelve verses) of On the ball, with music by brother-in-law Percy Harrison, had been vey successful. Hamilton was never a member of the Amalgamated Press staff. He always remained a freelance writer. For each Gem story and each Magnet story, the payment was as much as eighteen guineas. 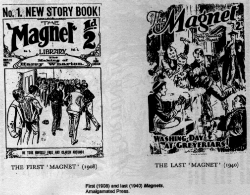 When Magnet ceased publication in 1940, the payment was fifty pounds per story. Stories published by Amalgamated Press were required to be ‘wholesome’. Thus, in Gem and Magnet, smoking, drinking, gambling and betting were strongly condemned – at least for schoolboys. The readers of the Magnet had been duly warned. A traveller, observer, and commentator, Hamilton often took the opportunity to express his views – particularly in the Magnet. To this extent he was an unusual writer of juvenile ficion. This aspect of Hamilton seems to have been missed by critics, who are more concerned with his creation of anti-hero Billy Bunter. Among other sights, the Greyfriars fellows had a look at the immense new naval base under construction, and they found it interesting enough, and as they were not old enough to be taxpayers, they did not bother about the millions that were being flung away in that far corner of the East. Mr Vernon-Smith explained to them that the immense base was necessary for the security of the Empire, according to the best militay and navaI intelects available. “You see the next war if it comes at all, will be in the air, so naturally they devise a naval base to meet it. But bless you, they might have made it a cavalry barracks. I’m rather surprised that they didn’t really”. Mr Vernon-Smith had the pleasure – or otherwise – of paying away a small fortune evey year in the shape of income tax, which doubtless caused him to regard such expensive futilities with a baleful eye. Travel, sickness, and a heavy work load caused problem’s for Hamilton’s Publishers. The stock pile of scripts was always small, and any delay in receipt meant having to engage a substitute writer or writers, often members of the editorial staff. These substitute writers were instructed to imitate Hamilton’s style, but this was no easy matter. There was a difference between the Gem style and the Magnet style, for instance. While several writers achieved some resemblance, most failed; and this was apparent to numerous readers who wrote to the Amalgamated Press asking when the ‘real’ author would be back. This fact would have surprised George Orwell, who suspected the Greyfriars stories were written by a team to a set style, which was easy to follow. Hamilton’s reply was that he had “written them all”. Hamilton preferred not to acknowledge the substitute writers. He detested their use of his characters and pseudonyms. One writer actually killed off one of his characters. Others introduced new characters. Greyfriars featured in all the 1683 Magnets published, and Hamilton wrote 1380 of them (about 82%). The balance is credited to 25 authors, ranging from a single story to the 96 by George Richmond Samways. The latter joined the editoial staff in 1914 at the age of nineteen. However. Hamilton wrote only about 66% of the St. Jim’s stories in Gem. After 1926 he wrote few new St. Jim’s stories. In 1931 acting on a suggestion of a long-time reader, 404 ear1y stories were republished in Gem, some with minor editorial adaptation. By 1919 Magnet and Gem were extremely successful and both had a strong following of girl readers. Accordingly, Amalgamated Press decided to publish a girls’ school story paper. By now, Hamilton was writing 50,000 to 60,000 words each week, but he readily agreed to write an additional weekly story; and the first issue of the new paper was duly published on 17th May 1919, the Cliff House story being written by ‘Hilda Richards’. But School friend had a different editor to the boys’ paper, and there was concern that Hamilton would not cope. He was told that his priorities in order were, (1) Magnet, (2) Gem and (3) Boys Friend. 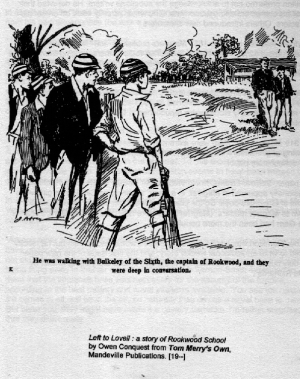 The latter had the Rookwood School stories by ‘Owen Conquest’. These shorter stories first appeared in 1915. So after the first few issues of School Friend, the stories were written by Horace Phillips as Hilda Richards. The result was two Cliff House Schools. School Friend stories now had no connexion with Greyfriars in Magnet. Hamilton retaliated by using his Cliff House girls more frequently in the Magnet Greyfriars stories. During the twenties and thirties most readers believed that Frank and Hilda Richards were brother and sister. In 1922 Hamilton bought two properties in Southern France, one at Menton. At this time he was hugely productive, often exceeding 80,000 words in a week. However in 1926 he returned to England and never again visited Europe. Hamilton’s best known adventure series was King of the lslands, which started in the first issue of Modern Boy in Januay 1928. He also wrote the ‘schooldays” of the comedian Will Hay at ‘Bendover College’. Hamilton’s writing reached its zenith in the Greyfriars stories of the late 1920s and early thirties. Between 1928 and 1931, only 13 stories were by substitute authors. From 1932 to the last issue of Magnet in 1940, all the stories were by Hamilton. At its peak, the circulation of Magnetwas almost 250,OOO – and this in a time of depression. After World War 2, Hamilton wrote stories about six new schools. (He created about 100 schools in all.) But the major development in those years occurred when the publisher Charles Skilton approached Hamilton to write a Greyfriars story in hardback form. Initially Amalgamated Press claimed rights to the Greyfriars characters, but it eventually agreed to the pubIishing of such stories, providing it was not in serial story-paper form. The first book, Billy Bunter of Greyfiars School, was a huge success. The firnt printing of 10,OO0 was followed by two reprints, making a total printing of 25,OOO. Hamilton only wanted his normal payment for a story, but Skilton suggested a royalty. So Hamilton received about one thousand pounds instead his expectation of one hundred and fifty pounds. In 1962 a TV series of Greyfriars and Billy Bunter, scripted by Hamilton, was producd by the BBC. They ran for five years. Later there were six annual Bunter Christmas stage shows. In all, Hamilton wrote at least 5000 stories (the equivalent of 1000 novels) typing them directly on a Remington No. 7. They appeared written under 28 pen-names, in 47 different publications. 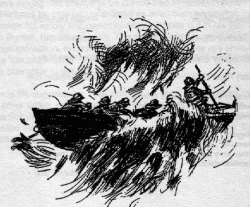 Over 3000 stories were reprinted, sometimes in shortened form, in other publications. Some 75% ofSchoolboys Own Library were such reprints. Hamilton never married. His life interests were writing stories, studying Latin, Greek, and modern languages, chess, music, and gambling, especially at Monte Carlo. A kindly man, he had a lifelong affection for his sister Una, and her daughter Una Hamilton Wright. He was still writing after he tumed eighty. Two events particularly delighted him in his latter years: in November 1959, the BBC broadcast his Latin versions of popular songs such as Waltzing Matilda, under the title of Living songs in a dead language; and in June 1961, a Bunter story in Latin was published in the Times Educational Supplement. He died later that year, on the 24th December 1961. Did Hamilton ever fail to have his works published?. It is believed that only one Greyfriars story was ever rejected. However a translation of Horace’s Odes, crossword puzzles in five languages, and Faith and Hope, his views on religion, were rejected as not having a sufficient market. If Hamilton’s writing was a phenomenon, then the continued interest in his writing is phenomenal. George Orwell would be amazed. In 1941 W. H. Gander of Manitoba, Canada, established an occasional paper, Story Paper CoIlector for the discussion of boys’ papers and story books. Considerable space was devoted to the writings of Hamilton. Five years later Herbert Leckenby produced a similar monthly paper in England. This was called Collectors’ Digest. In 1966 the two papers were incorporated as Story Paper Collectors’ Digest. By December 1993 no less than 584 monthly issues, and 47 annuals, had been produced by Collectors’ Digest, and later Story Paper Collectors’ Digest. The present editor, Mary Cadogan, writer, critic and broadcaster, has widened the scope to include girls’ story-papers and general juvenile literature. We owe a great debt to W.O.G. Lofts for his research of authors and their publications, and also to Eric Fayne and Roger Jenkins, both shoolmasters by profession, for their many articles on Hamilton and his writings. Mary Cadogan has added a new dimension with more emphasis on girls’ stories, as well as her appraisal of not only Hamilton but other authors. In 1969 Howard Baker, a former Amalgamated Press editor, now a publisher, set out to produce on good paper and in bound volumes, facsimilies of the ‘old’ story-papers. His main object was to produce evey copy of Magnet, and a selection of other papers. Permission to do this was negotiated with Amalgamated Press. Unfotunately Baker died in 1990 after some 245 volumes had been produced Of these, 25 were St. Jims stories (Gem) and 176 were Greyfriars (Magne). Only about 150 issues of Magne were still to be published out of a total of 1683. So the work is not quite complete. 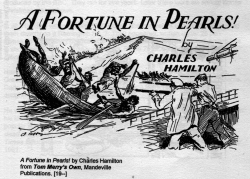 Charles Hamilton’s writing has always to be considered in relation to the time in which he lived. Perhaps he may be considered as even then somewhat ‘old-fashioned’. Homever his kindly and peaceful nature comes out in his stories. The underdog, even Bunter, usually wins out. The same applies to most of his students of foreign extraction, including Jewish extraction. They are always supported by the ‘decent fellows’. With Hamilton, it was not race or colour that mattered but the character of the individual. Charles Hamilton’s life suggests an inner conflict. He must have written more words than any other writer, past or present. Yet he could have been an academic in Classic or Modern Languages. When asked why he had preferred writing, he intimated that there was nothing better than writing for boys. To the scholarly Hamilton there was no conflict. Reg Moss attended Te Aro Infant School in Ghuznee Street (later on the Terrace), St Mark’s School and Wellington College. In World War II he saw service as a Welfare Officer with the Arm. His university study was as an older student at Victoria [University of Wellington New Zealand]. Besides the School story his interests include English classics, stories of humour and detection, New Zealand and Church History. The mystery was solved in the 1970s. The Howard Baker facsimilies were followed by numerous publications on the life and creations of Charles Hamilton. Above all was the discovery of the long established, but privately circulated, monthly magazine Story Paper Collectors’ Digest. A bibliography appears here in the original publication. It will be included on this page when it has been edited for the internet. The Society of Friends of the Dorothy Neal White Collection Inc. gratefully acknowledge the assistance of Lynne Jackett and Joan McCracken in the preparation of this issue. The Dorothy Neal White Collection is housed in the National Library of New Zealand Te Puna Matauranga o Aotearoa.